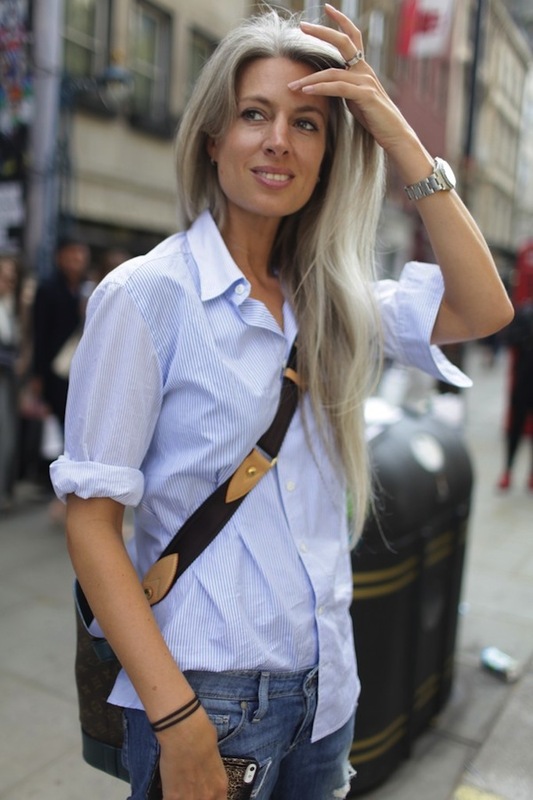 Sarah Harris, Fashion Features Editor at Vogue, started going grey at the age of 16. She says: ‘It’s amazing the consternation and/or bafflement this is causing the people around me. I am ‘brave’ apparently. Or ‘mad’. And though I remain determined I can’t deny a frisson of concern at their horror. What if they are right? How levelling to know a stunning, stylish, beautiful woman has the same issues as the rest of us.. It just goes to show..it’s never one thing..it’s the whole person and their ‘look’. It’s about all those cliched, over-used words..honest and authentic..and still being utterly fabulous. February 27, 2015 - 9:48 am .virginia.romo. Funny. Just yesterday wrote two sentences an drew something about that theme. Scheduled for Tuesday on the blog. She looks terrific, btw. Got way over this long time ago. No, they are not right Ms Harris. You are! Man – you beat me to the punch! Will profile her for my upcoming “uniform dressing” post. She is amazing! Lover her style, love her hair. I love people celebrating their natural colouring rather than trying to change or disguise it. The Ride of Our Life!